The Shoulder of Mutton Pond. The Shoulder of Mutton Pond is first clearly depicted on Rocque’s 1745 map, which had been surveyed the previous year. This map accurately shows the core areas of the gardens, which had been surveyed previously by Roque a decade earlier, but the depiction of the serpentine lakes as subsequently constructed is rather schematic and they are not located accurately in the landscape. Subject to these provisos, Rocque shows the Shoulder of Mutton Pond as a broadly oval-shaped water body between The Reservoir and Lake Pond to the west, and the Heronry Pond to the east. Interestingly, Rocque labels the Shoulder of Mutton Pond as the ‘House Field Pond’– this is presumably a reference to a historic land division named after the mediaeval manor house, which is believed to have been somewhere in this part of the park. This name has led to some debate: one suggestion is that the Shoulder of Mutton Pond was an old feature of the park which had existed in some form at the time of the former manor house. However, it has been pointed out that the western view by Jan Kip, of about 1715, takes in part of the area of the later pond and shows nothing in the area but a plain crossed by trees. The Kip engravings are not conclusive evidence, as they are known to be unreliable in detail. However, assuming in this instance that what is shown is correct, it may be that the name ‘House Field Pond’ relates to the field rather than directly to the house after which it was named, and that the house and pond were not co-existent. If this is correct, it would be consistent with the possibility that the deeply excavated hollow which contains the pond in its present form is part of the same project which produced the neighbouring Heronry Pond. The Shoulder of Mutton Pond from the north. It may be noteworthy in this regard that Rocque’s 1735 Map appears to depict the areas both of the Shoulder of Mutton Pond and the Heronry Pond to the east as being subsumed into a single water body. It is interesting to speculate why this, assuming it represented a firm intention, was not carried through. Several possibilities suggest themselves. The first is that there was simply a change of plan driven by aesthetic considerations. 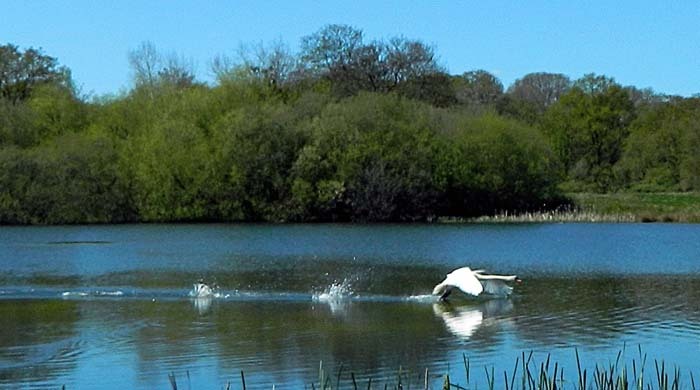 It may be that, during the many years of the lakes’ construction, the highly formal outline of the water body as originally conceived was modified in line with changing fashions in favour of a more naturalistic configuration. The second is that it was found convenient to maintain the old estate road which passed the front of Wanstead House and ran south through the projected site of the lake. It is even possible that there were local objections to removing the road, which was outside the closed area of the park. The third, perhaps most likely, possibility is that problems with the water supply began to manifest themselves at an early stage of construction. Creating the Shoulder of Mutton Pond as a separate entity would mean that the water which entered it from the west was retained until it rose to the level of the overflow channel. This would ensure that water was always visible from the south end of Wanstead House. Later partitioning of the Heronry Pond perhaps adds credence to the possibility of a hierarchy of water bodies based on their visibility from key locations. Finally, it may be that Lord Tylney's known financial problems in the 1740s resulted in the construction of the lakes being hastily finished, and that their final configuration was based on the work which had been done up to that point. Whatever questions remain about its origins, there seems to be little doubt that the Shoulder of Mutton Pond in something resembling its present form was constructed alongside the Heronry and Perch ponds and was completed by the 1740s. Searles’ 1779 Map depicts a channel running into the Shoulder of Mutton Pond from the Lake Pond and thence into the Heronry Pond. This is clearly part of the overall water management system of the Lakes in Wanstead Park. The pond is also depicted as being surrounded by banks, with a path running north-south across the division between this pond and both the Lake Pond and the Heronry Pond. The 1813 “Rough Plan” depicts the Shoulder of Mutton Pond in broadly the same way, although without the channel. By the time of the 1815 Doyley Map, the Pond appears to have been re-shaped and extended slightly to the west. These alterations appears to have taken place at the same time as the Reservoir was planted over, and may have been part of the same programme of works. All subsequent maps depict the pond with essentially the same shape and size. The pond survives today in broadly the same form as it is depicted in the nineteenth century, and in a generally fair condition, though with some areas of silting. The water level seems slightly lower than it was in the early twentieth century, and it falls further during the summer months. However, it is sustained by groundwater even in the driest years. It was long used for swimming, and a jetty and diving board survived until recent decades.